It is fully funded by The Christie charity and aims to offer patients a more seamless experience with more consultation rooms, improved access to testing facilities and a new appointment system with self-check-in screens, that will help to reduce patient waiting times and increase capacity. 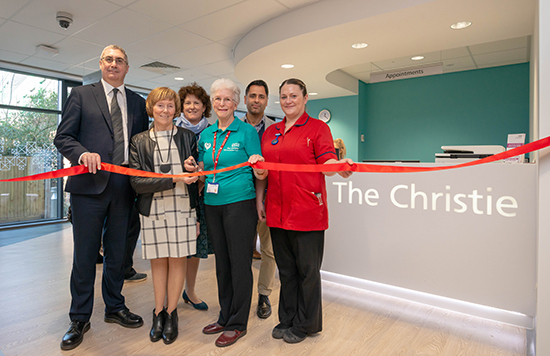 Patients Janice Kostenko and Pauline Nieri, joined Chief Executive, Roger Spencer to cut the ribbon at the entrance to the new unit, accessed via the main hospital corridor. Janice Kostenko first received treatment at The Christie in 1954 for a kidney tumour, when she was just nine months old. Now, 65 years later she is still a patient at the specialist cancer centre after also having a tumour in her stomach. Roger Spencer added: “Thanks to advances in cancer care we celebrate the news that patients are living with cancer much longer than ever before. This means that we are seeing patients in the outpatient clinics over a longer period of time, sometimes for many years. All outpatient clinics that were previously held at the department on Wilmslow Road have now been transferred to the new department accessed via the main hospital corridor from Palatine Road. Patient check-in screens are at the entrance to the new unit and a new outpatient bloods room is due to open in April. Located next door to the recently refurbished dining room, the new facility provides patients with easy access to refreshments and comfortable seating just a few steps away. The Christie NHS Foundation Trust has been ranked ‘Outstanding’ twice by the health regulator the Care Quality Commission (CQC) which referred to it as ‘exceptional’ and ‘a leader in its field’. It not only commended the Trust for its effectiveness and care but highlighted its work in shaping the future of cancer care and noted the reach and influence of its clinical research projects. The CQC also rated The Christie the best specialist trust in the country, and one of the top three trusts overall in England. The Christie charity supports the work of The Christie NHS Foundation Trust through its fundraising activities and delivers projects, equipment and improvements that are over and above what the NHS funds. The charity has more than 50,000 supporters who helped raise £15.4m last year.